THE HIGH COST OF WAITING. WHY SOONER IS BETTER WHEN IT COMES TO RETIREMENT PLANNING. When faced with a major life decision such as whether to move from the home where we have made a life, most of us can think of many excellent reasons to delay that decision indefinitely. And why not? The known is always more comfortable than the unknown; and doing nothing invariably feels far easier than doing something. The trouble is that by forestalling a choice like this, many of us will wait until a time when our choices can become limited or we have no choice at all. When an unforeseen change in our health or our finances will predicate a change in our lifestyle—and suddenly, it’s our children or doctors who are deciding our future for us based on what’s available and affordable at that time. 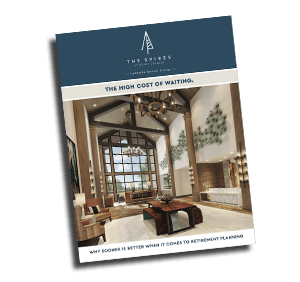 Download our Cost of Waiting Guide to understand the choice and options ahead of you, and learn the benefits of putting a plan in place for your future, today.